Friday's stock market plunge in the wake of BrExit that caught the financial markets, bookmakers and pollsters by surprise who had by the close of polls all but discounted a REMAIN outcome and thus sent stock futures and sterling soaring, only to do a panic reversal a couple of hours later as the actual results started to be announced with the initial triggers being results out of Sunderland and Newcastle. And so with each result a new wave of selling would hit the markets that by 5am had seen the FTSE futures plunge to below 5800, and sterling to spike below £/$ 1.32. Which triggered waves of doom laden commentary warning of End Times for the UK economy, stocks, housing and sterling, as so called analysts published reams and reams of nonsense to explain why the End Was now and stocks were set to literally crash into a brexit black hole. Effectively all those who had been wrong for the 7 year duration of the stocks bull market were once more proclaiming its demise, and it did not matter what the FTSE actually did post Brexit for the blogosfear perma-doom infection had firmly spread and taken hold of the mainstream press such as the FT, who already predisposed to SELLING FEAR and PANIC to the masses, of doom laden calls of an imminent Brexit disaster, a BrExit Lehman's moment even! So what did the FTSE actually do? Well, the FTSE futures bottomed early Friday morning at about 5750, before the markets opened, and then with each passing trading day has gathered strength and momentum to the UPSIDE! With the last FTSE close of 6360, its highest since April and positive for the year. 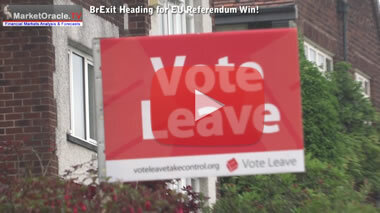 Thus a Brexit forecast implied that the FTSE and Sterling WOULD PLUNGE on Brexit night, especially as in the immediate run up to the count the FTSE and Sterling were strongly trending in the WRONG direction by discounting a REMAIN win, which was also true of the bookmarkers and pollsters all of which was resulting in an excellent risk vs reward opportunities to profit from as illustrated by the following article and subsequent video posted Thursday afternoon as the bookmakers and markets increasingly discounted a REMAIN outcome. And then the polls closed and all hell broke loose as YouGov confirmed that REMAIN would win triggering a further sharp rally for the ftse futures and sterling that was sustained until the actual results started to be announced shortly after midnight. 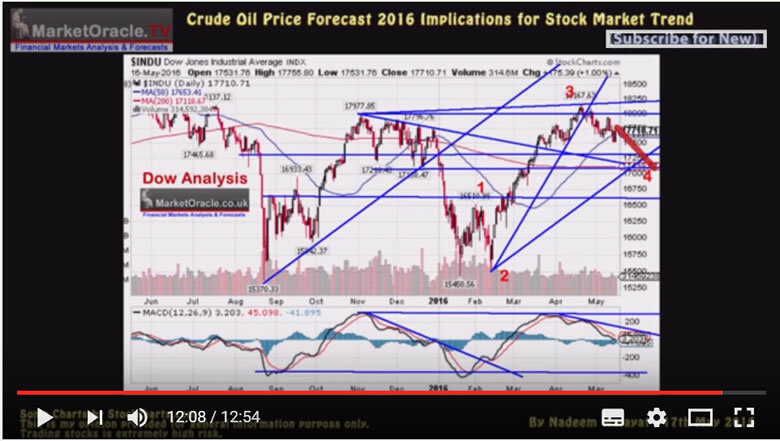 Which I covered in this comprehensive video of exactly what happened in the markets during a very volatile trading session. 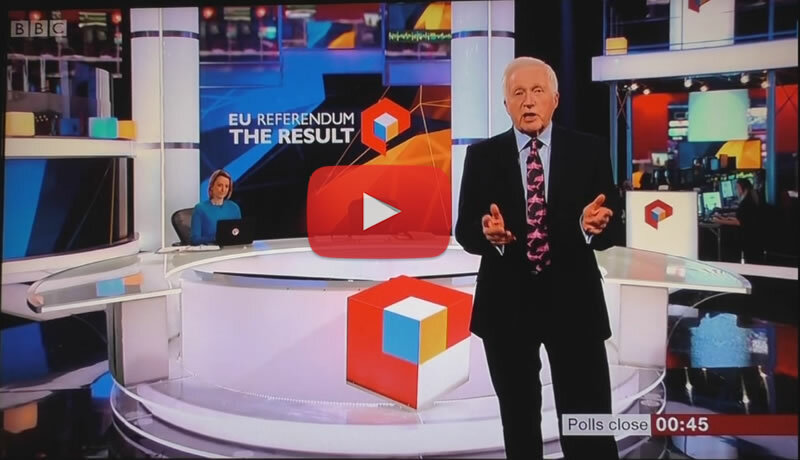 Whilst the following video highlights key events out of 8 hours of the BBC EU Referendum results coverage. So against prevailing year long perma-doom my consistent view ALL year has been that the stock market, FTSE and Dow would trend towards NEW ALL TIME HIGHS before the end of this year. Whilst my last in-depth analysis of Mid May concluded that stocks had entered a correction that would see the Dow trend lower towards 17,000 by the end of June 2016, just as that which has subsequently transpired. Therefore, so far the stock market has been trending inline with my expectations i.e. to temporarily plunge on Brexit, and now having recovered ALL of the decline so has done nothing to alter my long standing view that the stock market remains on track to trend towards new all time highs during the second half of this year as the above video of Mid May illustrates, and which I will come back to in great detail in forthcoming analysis but for now take this as another warning not to listen to the perma doom near always wrong crowd who today are once more busy peddling crash, collapse, and worst bear market in history fear, that if they actually acted on their calls would now also be going broke! This whilst the likes of the FTSE clearly remains firmly within its trading range which for a bull market tends to be a precursor for breakout to new highs, as has been the case for over 7 years now and which is the message I have iterated for the duration of this stocks bull market. Ensure you are subscribed to my always free newsletter for my next comprehensive analysis that evaluates the many future consequences of BrExit.